I looked around at the bushes next to the block of flats, wondering what on earth he was pointing too. It didn’t seem to be particularly obvious. All I could see was a lot of soil, with some plants growing out of it. And I was pretty sure he wasn’t pointing to a dandelion leaf. “There. Do you get it?” he went on, fighting the pull of his hound which was clearly bored of the conversation. Catherine joined me in peering into the greenery in confusion, before backing off again as swiftly as possible. Then I moved slightly to the left, aligning myself with the man’s line of vision. Then I saw it. A small tree trunk that had twisted and contorted. Rather than growing directly up as you’d expect, it had gone to the right before heading up, providing a sort of N shape, before splitting off in several different branches. “Yep, I see!” I replied, leaving Catherine still confused, and me wondering whether I’d stumbled across some sort of artistic genius, or Vauxhall’s local nutter. I decided to think the best of him, and went for the former. Finally succumbing to his dog, he wandered on up the path ahead of us, stopping a few minutes later and delighting at pointing out a group of goslings swimming up the river with their parents. I began to wonder if my assessment had been correct. “You wouldn’t think they’d have enough to eat out here,” replied Catherine’s mum, kindly. “I think they eat the moss on the stones,” he replied, pointing over the wall and down to the rocks which lay bare thanks to the low tide, before his dog finally won and dragged him off into the distance. Our tour guide gone, we had the path to ourselves again, leaving us to stroll on, slowly pushing Sam’s buggy over the bumpy pavement, whilst Sam himself took in his surroundings. He was somewhere new and was making the most of it by ensuring he looked at absolutely everything he could. His head would turn left, stare intently for a few seconds before sharply turning to the right and doing the same thing on that side. A few seconds later and he’d be back to the left. It was as if he was scared that if he didn’t look at absolutely everything, he’d miss something important; something vital that he wouldn’t be able to live without seeing. Although quite what that could be on the banks of the River Thames a short way on from Vauxhall Bridge, was anyone’s guess. 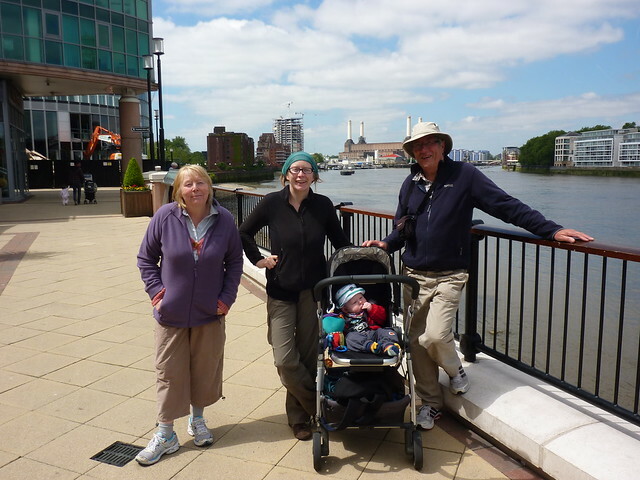 Catherine’s parents had joined us for a section of the Thames Path, using the six mile challenge of walking to Putney as a perfect warm up exercise for a forthcoming trip to Everest Base Camp, or so her dad told us. It was hard to argue with that comparison. The slow moving flow of the River Thames as it makes its way through the capital has often been compared with the delights of Nepal; the gentle climb up some steps up to a road, easily providing an experience not too dissimilar to walking 5380 metres above sea level. Although obviously the riverside views are far superior. Not that the Thames Path seemed to want to spend much time by the river. After joining the path at Vauxhall, we’d almost immediately been diverted away down the busy Nine Elms road, past the excitement of New Covent Garden market and the wonder of a branch of Booker Wholesale. Who really wants to see snow topped mountains when you can look at an orange shed occupied by what Wikipedia describes as “Britain’s largest food wholesale operator.” There simply is no comparison. In its operating heyday, the station must have been an imposing, and not too delightful sight. For fifty years smoke would have belched out of its four giant chimneys, powered by an annual intake of a million tonnes of coal a year. The power station’s position next to the river was a practical one, allowing the coal to be delivered by barge and hauled off by two giant cranes which remain by the riverside to this day. It was a reminder, if there ever needed to be one, that the Thames wasn’t always a nice place to be. A dirty, mucky river, filled with pollution. Who’d want to be near that? Not for nothing was much of the older housing stock on the river built for councils in the 1950s and 60s. Low end housing, built in a not especially desirable place. Now it’s all changed. The riverside is full of high end apartments. Flats with riverside views command eye-poppingly high prices. 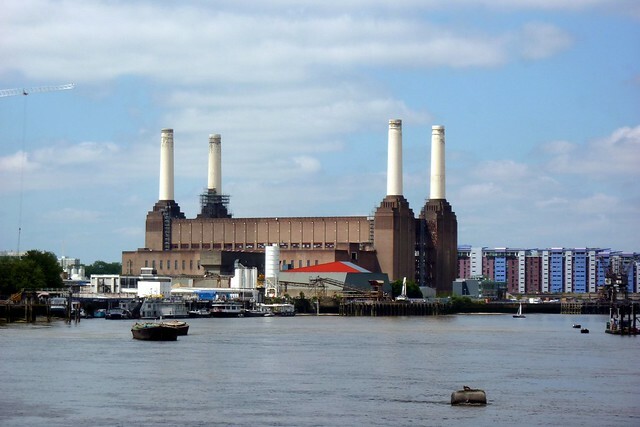 And soon Battersea Power Station would be joining the Thames accommodation revolution. After decades of stalled plans, including redeveloping the site as a theme park, building work had started on a massive 40 acre complex of housing, retail and office space. Private money had even persuaded the powers that be to extend London’s tube network to serve it all, despite being a whopping two minutes from a National Rail station. As we collectively peered through the hoarding at the building, surrounded by empty land, it came to me that this was a view that soon would never be seen again. Once development had been completed, the power station building would be surrounded by new tower blocks. 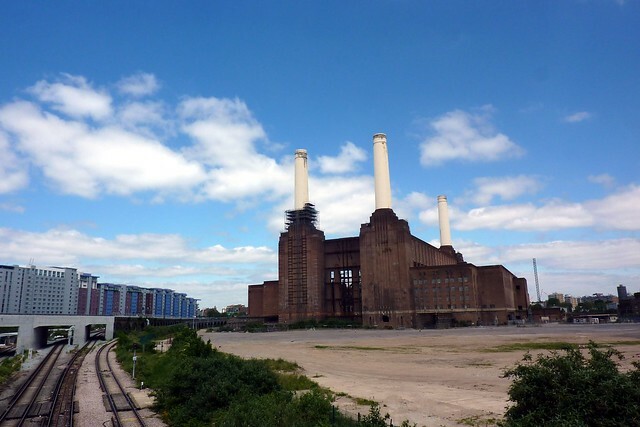 Battersea’s skyline would never be the same. Perhaps the one good thing that can be said about new residential developments is that they usually open up access to the river to the general public. 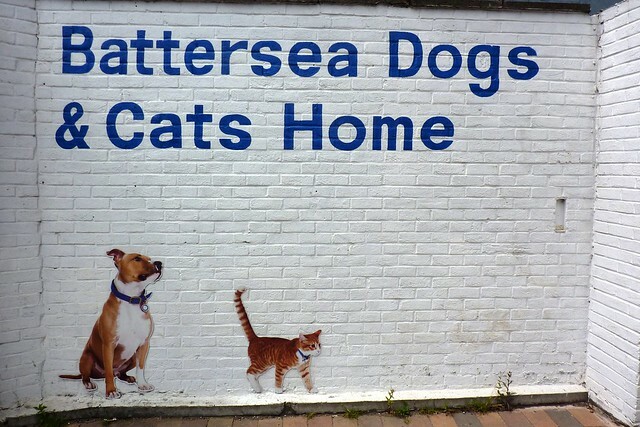 No doubt in a few years’ time, the Thames Path will be re-routed away from the roads and on to the other side of the power station, but for us it was a meander down Battersea Park Road, past the world famous Dogs (and Cats) Home and up to a roundabout to an estate agents whose windows were filled with adverts for outrageously expensive houses. “Have you met Sam?” asked a sign outside the estate agent’s office, its windows proudly offering a two bedroom flat for a mere £2.5million. “Yes, we’ve met Sam,” we replied in unison as we pushed a sleeping baby past the picture of the agent’s sales manager, and into the greenery of Battersea Park beyond. 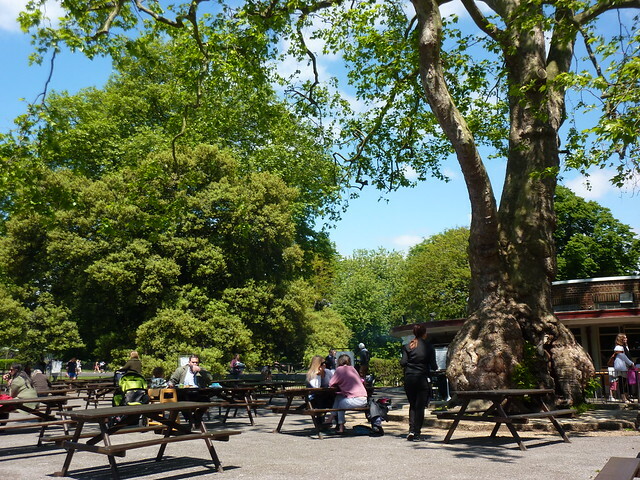 London can be an extremely green place when it puts its mind to it, and Battersea Park is a prime example of it. 200 acres of greenery, so amazingly close to the centre of London. It was beautiful to walk round in the sun and it seemed that half the local population had decided to pay a visit. And it had a café too, with an extensive outdoor area next to a duckpond. A perfect place to have lunch, perhaps? After a lacklustre lunch, which for Catherine’s parents consisted purely of a packet of crisps each, washed down by a cup of tea, we headed on in the hope that we’d a) find the river again, and b) find somewhere to eat where the food was vaguely edible. 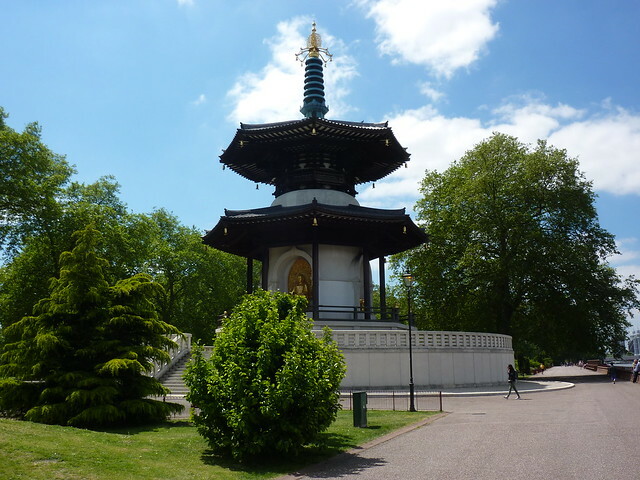 The river was easier to find; it was lurking just behind a few bushes, next to some tennis courts, and with it was perhaps one of the park’s more unusual items: the Battersea Park Peace Pagoda, built in 1985 by Buddhist monks and nuns. Peace pagodas have been built across the world, created to be a focus for all people and help them in their search for world peace. Up ahead, at the end of the park, lay another great London landmark and one of the finer bridges to span the Thames; the Albert Bridge. 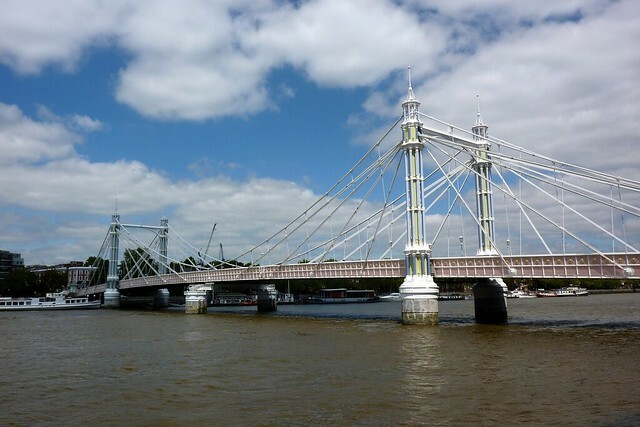 Compared to the pomp and grandeur of Tower Bridge, the Albert Bridge – naturally named for Prince Albert – is a lot more sedate, but no less attractive. The simple, thin spans and cables make it look rather delicate; as if it would be easily broken. Funnily enough, the bridge has had structural problems since it opened in 1873. The Albert was London’s original wobbly bridge – a title later taken by the Millennium Bridge at Tate Modern – due to the fact it would wobble if too many people tried to cross it. Signs had to be erected at each end ordering soldiers going to the nearby Chelsea Barracks to break step when crossing. The barracks closed in 2008 – inevitably to be demolished and replaced by luxury apartments – however the signs remain. Just in case. Originally a cable-stayed bridge, structural work by that ever present Sir Joseph Bazalgette incorporated elements of suspension bridge design in the 1880s, in an attempt to shore it up. However the bridge was never designed for, and continues to struggle to cope with the demands of modern traffic. In the 1970s further work was undertaken by placing concrete pillars in the middle, but even that’s not been enough. Traffic isn’t the sole cause of deterioration; the bridge woodwork is even rotting under the force of dog urine, thanks to it being a popular route to Battersea Park. “They’re probably all owned by people who have country homes for the weekend,” I replied, dryly. There was no doubt an element of truth in it though. Only a few days earlier I’d seen a report on the local news about how luxury flats were frequently marketed and sold to owners in the Middle East, and often barely occupied. There was no doubting the sterileness of the housing complex we walked through now. There was just no one, anywhere. Every flat looked deserted; every door to a private balcony firmly shut. Here we were in the heart of Britain’s largest city and it was like walking through a ghost town. Were it not for the buses passing over Battersea Bridge in the distance, it would be easy to believe that everyone had simply packed up and left the country. I still struggled to understand just who buys all these luxury apartments in the first place. How could there be so many people in the city earning the huge amounts required for Thameside living? There are only so many bankers and managing directors around. Yet the capital is full of these expensive districts where you wonder how on earth anyone affords their mortgage. And not just London either. Head down to the more rural parts of the Thames and you’ll find houses with their own private moorings taken up by improbably oversized motorboats. Amongst all these flats though, was a different kind of living. A number of houseboats are permanently moored here; the monthly cost of living in one no doubt a lot cheaper than the nearby alternatives. Looking at their more ramshackle appearances – although not by any means run down or in poor condition – it’s hard not to wonder what their richer neighbours thought of them. It was easy to imagine them looking down from their exquisitely presented balconies and getting outraged by the sheer audacity of the “commoners” living below. And it brought a smile to my lips just thinking about it. 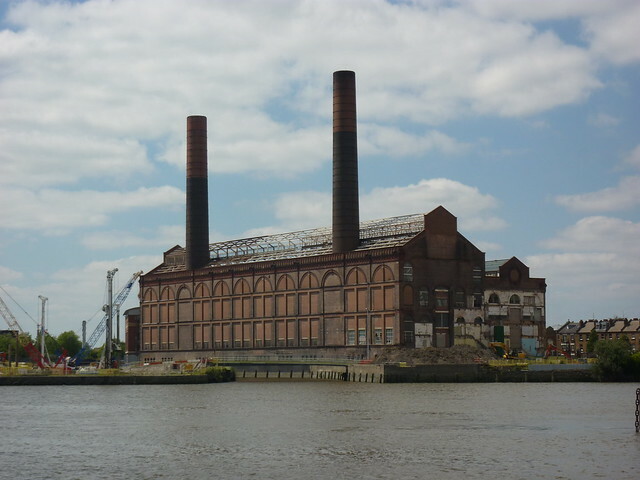 The second former power station of the day arrived after we’d crossed Battersea Bridge. Lotts Road, over on the north bank of the Thames, closed in 2002 after a history of powering London’s public transport. Opened in 1905, it was built by the Metropolitan District Railway Company, initially to power the introduction of electric trains on what is now known as London Underground’s District Line. It later powered more tubes and many of London’s trams, before being switched off after London Underground decided to take all its electricity from the National Grid instead. Ironically the following year, a massive power failure in the National Grid saw half the tube network grind to a halt for several hours. Since closure, Lotts Road has sat forlorn on the river, dominating the local skyline, however developers were already circling it for redevelopment. Three and a half months after we passed by, an official ground breaking ceremony took place and the work started in earnest. Lotts Road’s future? Luxury apartments, of course. Up ahead was a sign of what Lotts Road had in store. 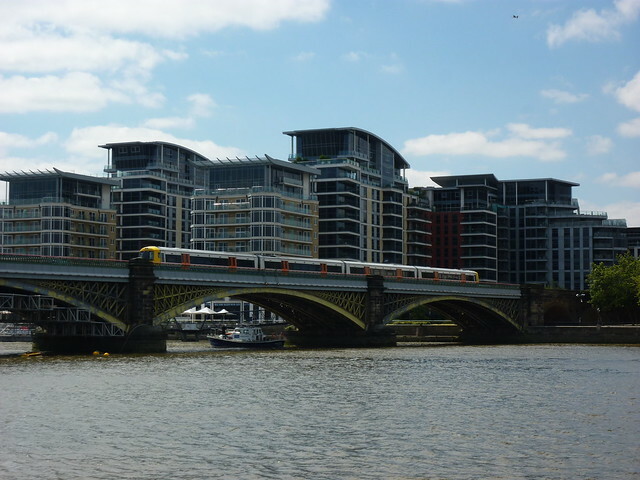 Both banks of the river were lined with residential block after residential block after residential block; the riverside an intense collection of steel and glass buildings; riverside view and balcony to those that can afford it. Breaking it all up a little, a railway bridge carrying London Overground’s trains to Clapham. 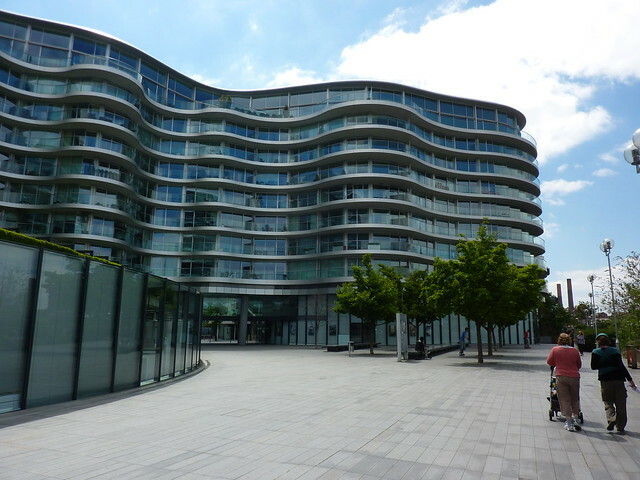 The flats on the north of the river even get access to their own station, called Imperial Wharf. Those on the south have less access to the trains, at least until a planned pedestrian and cycle bridge is built alongside. We wandered through the still empty riverside footpath; the main sound being Sam’s regular and emphatic “GHEEEE!”. He’d recently begun to start making noise in earnest, and regularly would get fixated on one sound or other. Today’s was one that sounded just a little like a form of Indian clarified butter. Such was his enthusiasm for making the sound that the riverside path soon rang with adults making their own contribution. The closer we got to Wandsworth, the more people seemed to be enjoying the sun on the balconies of their riverside apartments, but still the place was pretty deserted. Even a trendy looking wine bar with an outside seating area seemed to be struggling to pull in the crowds. Where was everyone, we wondered, before finding out: the exterior of The Ship pub was absolutely heaving, and inside didn’t look much quieter. A little further on, we passed a river that was making the end of its journey. The River Wandle is one of the 38 or so tributaries of the River Thames, and (funnily enough) flows not too far away from our house. From here we’d just need to follow the Wandle Trail down the river, and we’d be back home. But that would be a diversion from our true walk. 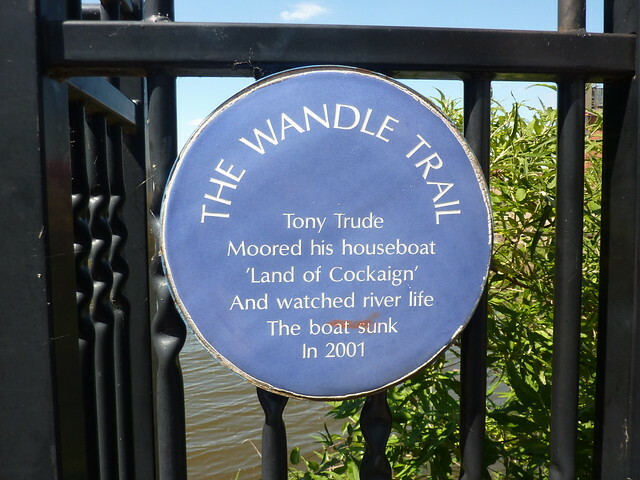 We weren’t Wandle walking after all. We were Thames walking! And that meant following the crowds through Wandsworth Park, and into the leafy suburbs of Putney. Putney Bridge loomed up ahead, marking the end of our walk. And I guess we could have technically walked home from there – Putney not being that much further from our house than Wandsworth. But why walk five miles down when there’s a perfectly good bus service? Oh and pub not too far from the bus stop. Swift half everyone? Don’t mind if I do. Next time: rowing boats everywhere, breweries everywhere, joggers everywhere, mud everywhere. First Published: 4 December 2013. Last Updated: 19 August 2015.